Eucerin is one of the brands under the Beiersdorf company promoting skincare and facial products. Working closely with dermatologists and researchers, Eucerin offers a wide range of products to suit all skin types and conditions from acne-prone to extra dry skin. Skin problems and issues are ameliorated using Eucerin products made from pure ingredients. People with skin conditions such as psoriasis, eczema, and atopic dermatitis can benefit from using gentle, moisturising products. Eucerin debuted in the skincare industry in the 1900s and has over 100 years of experience in the business. At the moment, it is available in several countries worldwide or through its online retail shops. In most countries, Eucerin products are only sold at the drug stores or the pharmacy. The brand Eucerin has a rather wide product range, designed for all types of skin and ages. The core of Eucerin is its dry skin range of products. Eucerin aims to address dry skin problems offering lotions, creams, cleansers, and facial wash to combat the effects of skin drying. 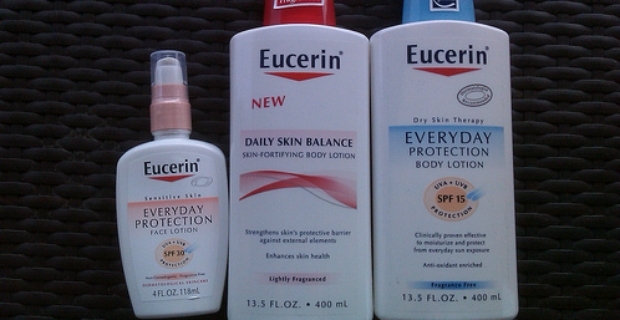 An example is the Eucerin lotion for various intensities of skin dryness from normal to extremely dry condition. Hand creams are also available for those who need to protect or repair damaged hands. Ageing is a problem faced by many and for this need, Eucerin offers facial products designed to meet the requirements of the mature epidermis by providing moisture-locking creams and components to make skin revitalised, young, and healthy-looking. Take your pick from gentle, soothing and redness relief cleansers, night creams and anti-wrinkle creams. There are also day creams with SPF protection. Special products include DermoDensifyer and HyaluronFiller. An Anti-Pigment fluid prevents or reduces skin discolourations. Another niche targeted by Eucerin is the baby market. Eucerin has developed special camphor creams for babies and children from healing, soothing ointment and shampoo to lip care and body wash. The brand offers sun creams with high protection for those who need adequate protection from the damaging rays of the sun. In 1998, Eucerin released its first clinically documented anti-wrinkle product, Q10 anti-wrinkle cream. Subsequent studies on the efficacy of sun care products also followed revealing positive results for patients. There was also another documentation on the ability of toners and cleansers to keep the skin clean. Hence, the success of the brand lies in producing premium skincare products supported by clinical trials. Eucerin products provide protection, relief and treatment. The range of products covers all skin types for both the very young and older people.